*Price while supplies last! Buy 6 or more for $1,875.00. Assisting Municipalities, Public Transportation, Schools, Military, Maintenance Technicians on the correct CNG Tank choice! Our CNG Tanks are USDOT FMVSS 304 and NGV-2 compliant certified, and tested to the highest standards. CNG Tanks come in 4 Types. Note: Compressed natural gas is very safe due to two important factors: the physical properties of natural gas itself and the CNG fuel system that is designed and built according to stringent quality standards. START YOUR TANK SEARCH HERE! Learn More about CNG Tanks Below! We sell all CNG Tanks (Types 1, 2, 3, 4). We have various types from different sources to help you with prices points and exact size requirements. Check out Warranties! We are also a phone call away to answer your needs. We have helped organization from mom and pop shops to commercial, schools, military installations. We Thank You in advance for choosing CNG United! Safety Comes First when it comes to CNG Tanks! Compressed natural gas is very safe due to two important factors: the physical properties of natural gas itself and the CNG fuel system that is designed and built according to stringent quality standards. The physical properties of CNG make CNG safer to use than gasoline. For instance, CNG has a limited range of flammability compared to gasoline which can catch fire and burn easily. In order for CNG to burn, CNG needs between 5 to 15% of air in the fuel mixture or else the CNG will simply not be able to burn. Search Tanks by an Advance Search! 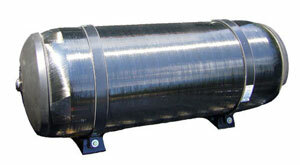 Type 1 CNG tanks are extremely durable and are made of solid steel. Type 1 CNG tanks are great to be placed under a vehicle and are the least expensive of all the types of CNG tanks. They are how every very heavy. They range from 2 to 13.5 gasoline gallon equivalent. Type 2 CNG tanks are very similar to type 1 CNG tanks; they are also made of steel, but type 2 tanks are lighter as a result of a thinner tank wall then wrapped with wire. The typical type 2 CNG tanks range in size from 4 to 17 gasoline gallon equivalent (“gge”). 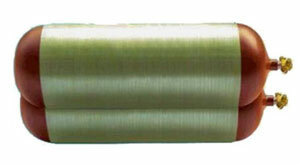 Type 3 CNG tanks are made of an aluminum composite core that are wrapped with a carbon fiber. Type 3 CNG tanks are excellent for vehicles where the overall weight of the CNG tank will matter for vehicle performance. The available sizes range from 2 gge to 30 gge (gasoline gallon equivalent). 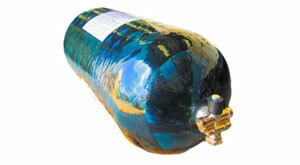 Type 4 CNG tanks have a plastic bladder and are wrapped with carbon fiber and covered with a resin glaze; As a result, type 4 CNG tanks are extremely light and due to the very thin wall, type 4 CNG tanks can contain more capacity compared to other types of CNG tanks that have similar dimensions. 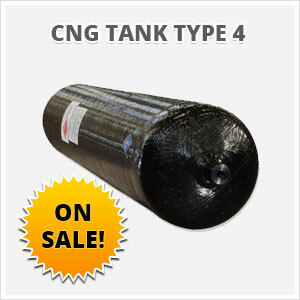 CNG is currently offering a CNG Tank Type 4 for sale. For these reasons, and because lighter tanks translates to better overall vehicle mileage due to less load to carry in the vehicle, type 4 CNG tanks are the most expensive and are typically ranged in size from 17.5 gge to 53 gge. 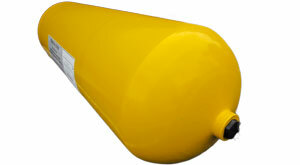 See Specials for CNG Tanks.